A toxic slag pile near the North Fork River in Clarksburg contaminated with arsenic, lead and zinc. EPA listed the North 25th Street Glass and Zinc site on the Superfund National Priorities List in September 2016. Over the years, the city of Clarksburg and state and federal regulators have made efforts to rehabilitate the property, which was also home to a zinc plant in the early 1900s. Today, the area is home to a warehouse and tire retailer. But as the years passed, the area has largely fallen into disrepair. Two years ago, the Environmental Protection Agency said it was going to take over cleanup of the site through its Superfund program after concerns surfaced that a nearby rail trail might be contaminated with lead, zinc and arsenic from the factories and leaching into the North Fork River. After extensive testing, the EPA determined the extent of the contamination qualified the area to be listed on the Superfund National Priorities List, which is basically the EPA’s "to-do" list when it comes to funding cleanups. Sites on the NPL, as it is often called, take precedence. James Lachapelle stands in the Northview neighborhood of Clarksburg. Lachapelle lives about a block away from the Superfund site. Lachapelle was excited. But at a community meeting hosted by the EPA in 2016, officials outlined a 5-25 year timeline for completing the cleanup. That tapered the 68-year-old’s expectations. "EPA, I love you to death," he said. "I’m glad you’re looking, but 25 years, it’s just a might long." Lachapelle’s concerns mirror those of some who live near the more than 2,100 Superfund sites across the country. The federal cleanup program deals with the most toxic sites in America, but since being established in 1980, federal resources for Superfund have shrunk considerably. As a result, the average time it takes to complete a cleanup under the program has lengthened. From 1986 to 1989, projects were finished, on average, about four years after a site was placed on the NPL. By 1996, the average time was nearly 11 years, according to the nonpartisan Government Accountability Office. Former EPA officials and environmental groups say less resources for Superfund ultimately harms the communities that live near them. "Every dollar taken away from that program means compromising public health, increasing the risk of disease as well as delaying economic recovery and job recovery for communities that need it the most," said Mathy Stanislaus, who ran the Superfund program under the Obama administration." Still, for some communities, like Clarksburg and Minden, in Fayette County, the perception remains that receiving a Superfund designation, and especially being placed on the National Priorities List, is better than not. Assistant city manager Anthony Bellotte is the city’s point person for the Superfund site. A lifelong resident of the Northview neighborhood, Bellotte has spent 44 years working for the city. He remembers the days when the neighborhood hummed with life, infused with jobs not just from the factory that now crumbles on North 25th street, but a handful that operated in the city. "The site itself … it was a rather large factory," he said. "There was a swinging bridge across the West Fork River and on the other side of the swinging bridge there was another factory called Adamston Flat. There were a lot of the older fellows that lived in Adamston and walked across the bridge and worked at Roland and then the guys at Northview walked across the bridge and worked at Adamston." Speaking from inside the handsome city hall building in downtown Clarksburg, Bellotte said even though it takes years to clean up the old glass and zinc factory site, EPA’s decision to place the site on the National Priorities List was "fortunate." He said if the site had not been added to the Superfund program’s National Priorities List, the city may have been on the hook to deal with the contamination. "We do feel very fortunate and this will ultimately end up with some cleanup and as a result of the cleanup it all goes toward future economic development," he said. The remains of the glass factory, which is now part of an EPA Superfund site in Clarksburg, WV. With the help of another federal cleanup program run by the EPA called the Brownfields program, Clarksburg has cleaned up the Adamston glass factory, as well as two other contaminated sites. With the Brownfields program, the EPA provides grants and technical assistance to communities to help them clean up a site. Local or state governments must pitch in a percentage of the costs to qualify. Superfund was created to address the most toxic, contaminated sites across America. In 1980, Congress passed the Comprehensive Environmental Response, Compensation, and Liability Act, or CERCLA, which established the Superfund. The law tasks EPA with determining how contaminated a site is and then determining how best to clean up the hazardous waste. Sometimes that can mean working with the site’s owner, or responsible party, to do a cleanup. Other times, the EPA pays for it themselves. 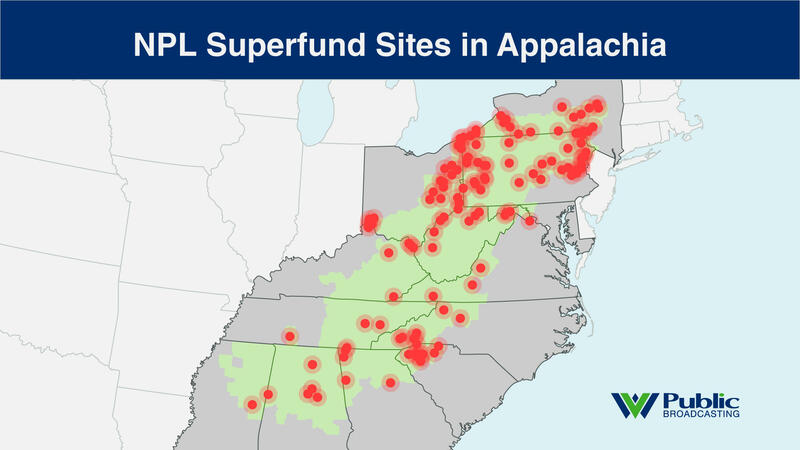 There are 243 Superfund sites on the NPL across Appalachia; 10, including the one in Clarksburg, are located in West Virginia. Superfund sites on EPA's National Priorities List. Getting a spot on the National Priorities List does not mean help will come quickly, said John Hando, who worked for the West Virginia DEP for 20 years as a hazardous waste inspector, which brought him in close contact with many of the state’s Superfund sites. Hando said West Virginia has a long history of supporting the war efforts associated with WWII and Vietnam. The state also has an early history in manufacturing. Those two elements have contributed to the type of sites listed under Superfund in West Virginia today. Early on Superfund was successful in West Virginia. "In the late 80s, you had, across West Virginia, lots of sites the state knew about and, of course, the U.S. EPA knew about," he said. "So, you had actions taken on the Ordnance Works site here in Morgantown. You had what was called the Leetown Pesticide Site out in the Eastern Panhandle. You had another Ordnance Works in the southern part of the state. Those were actions taken as soon as EPA could." Hando said Superfund is great tool the federal government can use to prompt action from companies that own contaminated sites. It’s often the only option for clean ups for sites where the "responsible party" has gone out of business, no longer exists or does not have the means to deal with the contamination. In the last two decades, federal resources have shrunk, which advocates say dilutes the ability of the EPA to both successfully and quickly finish cleanups. Superfund gets its money from two pots -- Congressional appropriations and, until about two decades ago, a tax on petroleum and chemical industries expire. Both sources are dwindling. From 1999 through 2013, Congressional appropriations to the Superfund program were cut from $2 billion to about $1.1 billion, according to a 2015 Government Accountability Office report. And in 1995, Congress let a “polluter pays” tax on petroleum and chemical industries expire. That tax paid for the Superfund and provided resources for EPA to clean up "orphan sites" or sites where there is no responsible party. In an interview, EPA Superfund site coordinator Melissa Linden said the agency did not feel declining funding affected its ability to run the program. "I don’t see that would decrease our ability to take action," she said. "It would make up reliant on prioritizing and potentially doing phased actions as we have in the past even on other larger sites." Christine Todd Whitman ran the EPA for three years under the George W. Bush Administration. During her time at the agency, one of her priorities was to push Congress to reauthorize the 1995 tax. She says the lapsed source of funding is affecting every aspect of the EPA’s ability to pursue new cleanups and advance ones already on the NPL. "All that is very technical that takes time and it takes people and it’s expensive and if you’re running out of money you’re working on the sites you’re working on and taking on new sites becomes less inviting, shall we say," she said. "They don’t have the money and they don’t have the personnel to do it. So, it takes longer and longer." Longer cleanup timelines affect those who live near Superfund sites. The EPA estimates approximately 53 million people live within 3 miles of a Superfund site, approximately 16 percent of the U.S. population. Studies show communities that live near Superfund sites often find the value of their home decreases. Even after a cleanup, it’s less likely property values will rebound. EPA Administrator Scott Pruitt has said removing sites from Superfund is a priority for the administration. The agency says it is doing that by enlisting the help of a task force and holding more responsible parties accountable for cleanups. But in its first budget request to Congress, the White House proposed slashing Superfund’s budget by about 25 percent. Congress ultimately rejected the cuts and the agency didn’t ask for major cuts in its fiscal 2019 budget request. Stanislaus, who oversaw the Superfund program under the Obama administration, said prioritizing Superfund would look like requesting significantly more resources. "There are a tremendous amount of success stories, but those success stories require commitment of resources for the cleanup and commitment for support for the staff," he said. "Frankly from my perspective, neither of that is occurring today." This story is part of an episode of Inside Appalachia. You can check out more of our coverage of Superfund sites in Appalachia here.